Serbia suffered a 2-1 defeat at the hands of Switzerland after having scored the opener in the game. In the second half, Serbia forward Aleksandar Mitrovic fell in Switzerland’s penalty box while struggling to reach the ball. German referee Felix Brych decided not to call a penalty and did not use the Video Assistant Referee (VAR). 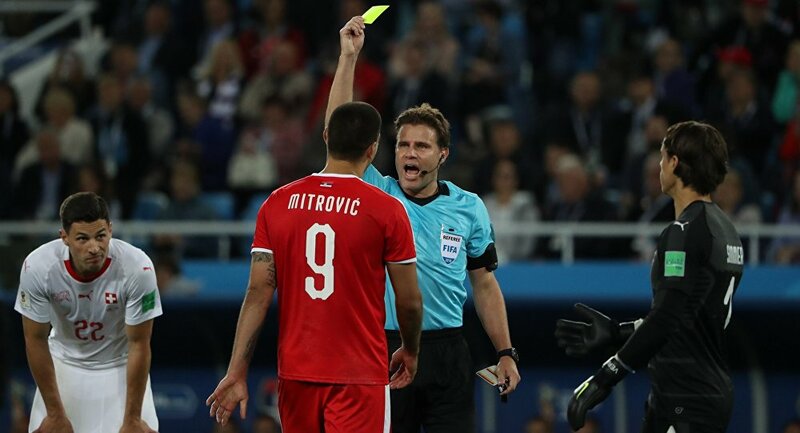 The Serbian national team will file a complaint with FIFA over a referee’s decisions during the World Cup group stage game against Switzerland, head of the Serbian Football Association Jovan Surbatovic said on Friday night. "We decided to file a complaint with FIFA over refereeing in the match against Switzerland. Apart from the episode with the penalty there were numerous other moments that were interpreted against us," Surbatovic told reporters. VAR allows match officials to review video replays of game episodes in order to avoid possible mistakes. Particularly, the tournament in Russia is the first World Cup event where VAR is used. However, Serbia head coach Mladen Krstajic argued Friday night there was little to choose between his side and Switzerland, despite their 2-1 loss, but his team were let down by poor finishing and missed a "simple chance." "As for the first half, we were satisfied, we played well and worked hard. Yet we missed a simple chance. I don’t think our opponent wanted to win more than us. We opened the scoring, they doubled it… Overall there was little to choose [between the two sides]. When we were leveled, we wanted to attack more, continue to press, and I even made an attacking substitution," Krstajic told journalists. He added that it is "not impossible" to beat World Cup favorites Brazil and although Tite’s side "is strong, they do have flaws." Serbia midfielder Dusan Tadic emphasized on Friday night had his side been better in defense, they would have avoided losing to Switzerland in their second and key group E match in Kaliningrad. "We should have been better defensively and we gave Switzerland too many chances. I am very upset that my team lost. In the upcoming match with Brazil we should concentrate on our defense, to avoid today’s mistakes," Tadic told journalists. Serbia captain and defender Aleksandar Kolarov said on Friday that his team only have themselves to blame for their 2-1 loss to Switzerland in Kaliningrad. "We knew that Switzerland is a very strong team. We had the ball, and it’s our fault that we lost. Now only a positive result in the match with Brazil will give us a chance to move forward and we will do all we can," Koralov told journalists. He added that the main thing for the team at this point is to recover psychologically and they "will continue to fight because there is a chance to keep on going in this World Cup." Switzerland head coach Vladimir Petkovic said on Friday that his team did not want to settle for a draw in their match with Serbia in Kaliningrad and their efforts to score were rewarded with a crucial last minute goal to seal a 2-1 win. "We gave our opponent too much space and they got their first goal because we lost the ball… We expected more and I would not have been happy with a draw. But we understood how to play against such a strong opponent," Petkovic told journalists. He added that Switzerland midfielder Xherdan Shaqiri, who netted the winning goal, deserved to be named the man of the match. "Shaqiri had a great second half, he played well. He is that kind of a player who likes football very much and invests himself fully. He deserved this award, he does his job very well," Petkovic said. Vladimir Petkovic also said he was "exhausted," but "thrilled" after his team's tough-fought victory against Serbia in Kaliningrad on Friday. "The atmosphere is unique here. The fans supported Serbia more today, but we were still pleased, I heard our fans too. I'm already exhausted, I have no emotions. But, of course, I'm joking. In the first half, when we were falling behind, it was difficult for us, but in the second half, after we scored a goal, I was thrilled. After the first half, hardly anyone could imagine that the game would finish this way," Petkovic told journalists. The head coach noted that football should not be mixed with politics and urged participating teams to respect each other. "Yesterday I said that we shouldn't mix politics and sport, it's important to stand aside politics. Keep in mind that we all need to respect each other on the field of play and beyond it. Sport should unite people," he said. During the match, the BBC reporters noticed that Swiss winger Shaqiri was wearing boots with an inscription of the Kosovo flag. After his spectacular goal, he clasped his hands to produce a symbol mimicking the double headed-eagle on the Albanian flag. When asked if the symbol meant anything, Shaqiri said that it was purely emotional and the gesture did not have any significance. In additon to this, the head of the Serbian football union has expressed outrage over Shaqiri wearing boots with a Kosovar flag during the game. "Before the game, we asked FIFA to forbid Shaqiri to play in boots with the flag of Kosovo. But the answer was that this is not a political gesture," the official said. Meanwhile, the hero of the match Zherdan Shaqiri said Friday night that his team had improved significantly and would not have beaten Serbia just a few years ago. "As our evolution is concerned, we see that we are improving a lot. Today, we were loosing in the beginning playing against a very good team, but then we leveled the score and turned around the course of the match," Shaqiri said. 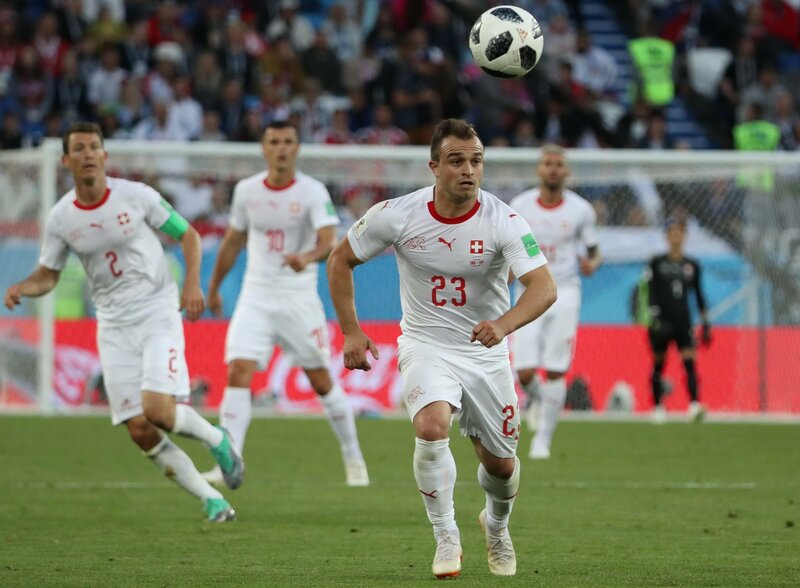 Shaqiri sealed an important victory for the Swiss's squad in a stoppage time after breaking the offside trap and cooly slotting the ball into the net and eventually was named man of the match. "I felt that I had a good chance and instinct just took over," he said speaking about his goal," Shaqiri said. Switzerland will now play Costa Rica in Nizhny Novgorod on June 27. A win or a draw will put them through to the round of 16. Serbia, who are on three points, must beat group leaders Brazil to move through to the knockout stage.